My breed was developed in England for the purpose of warning game keepers of poachers. I have guard dog instincts, but I make a good and loyal family pet as well. Because of my size, it would be wise to be sure that I have proper training so that we all understand and respect the house rules. My coat is short and sleek, so you don't need any special grooming talents. When fully grown, I am between 24 and 27 inches tall (61 to 68.6 centimeters) and I weigh between 90 and 130 pounds (40.5 to 58.5 kilograms). We have no Bullmastiff Breeders listed at this time. 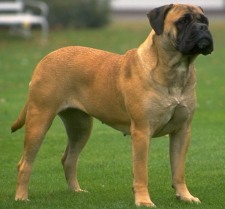 Click here to place your Bullmastiff Ad!